Happy Thanksgiving from all of us here at Greystone Manor! The entire Gallagher family made it home this year. There are so many of us now, we took over the dining room and opened up the ballroom to our guests. Between you and me, with all the preparations for the big day, I completely forgot my column was due. And then Rosa DiRossi, my best friend, who promised to provide me with today’s hot topic, told me at the last minute she was too busy to add anything else to her plate. If I could share what has her running around like a crazy person—albeit a happy crazy person—I’d have my hot topic, but I’d also be giving away a spoiler from Barefoot Beach, so . . . Sorry, there’s someone at my door. I’ll be right back. Well, what do you know, it looks like we have a hot topic after all. That was Shay at my door, my grandson Michael’s wife, you might have read about them in Christmas with an Angel and Driftwood Cove. 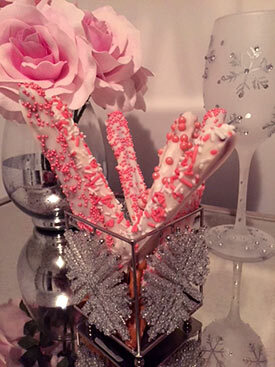 Anyway, Shay dropped off these gorgeous chocolate-covered pretzels that her uncle Charlie made. He thought they’d be perfect with our color scheme for this year’s holiday décor, and he was right. Charlie owns the Salty Dog, a pub on Main Street, and they specialize in pretzels and beer. He didn’t send me beer though. My beau, Jasper, won’t be pleased Charlie sent me anything at all, but that’s a topic for another time. And a hot topic at that. But I digress, it’s Shay and Michael’s news that will be the hot topic in Harmony Harbor—they’re having a baby! Shay wanted to keep the news quiet for a little longer, but Michael just spilled the beans to his cousins during their annual football game. I’m off to celebrate with everyone now, so I’ll be back next month to share some of our family traditions, as well as my tips for a stress-less Christmas.